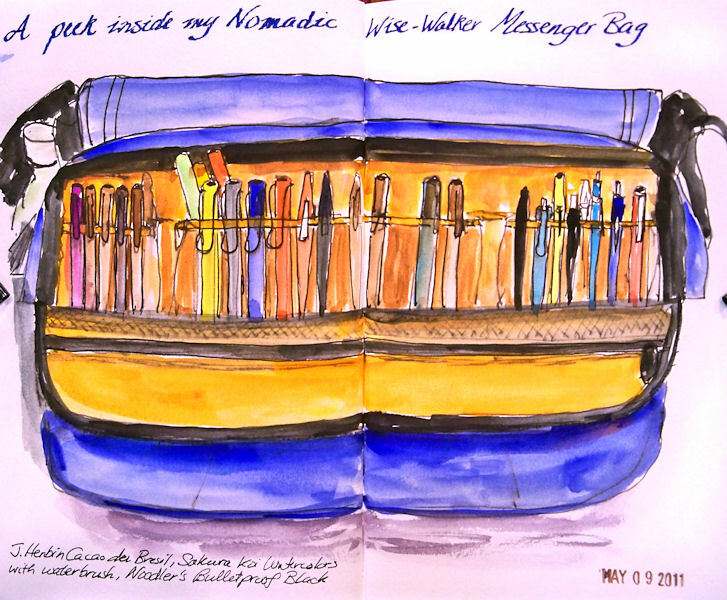 I have been dreaming of getting this Nomadic messenger bag for sketching materials ever since I saw it on the internet. 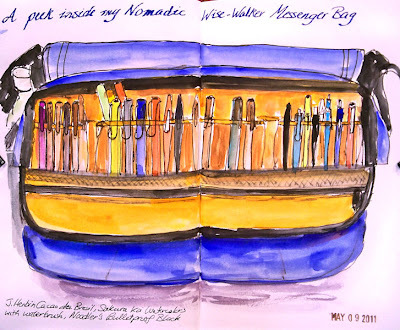 The messenger bag I'd been using for sketching supplies was a bit larger than what I needed, and had a couple of serious drawbacks that the Nomadic bag addressed. My husband got it for me as a Mother's Day gift, and it is just perfect for my needs! I unpacked my old bag last night and loaded up the new one. Here's the front of the bag. I selected the blue color, and it's a nice dark, neutral navy. It has a zippered pocket right on the front where you can keep identification, money, or anything you might need to get to quickly without having to open up the whole bag. As you can see, it easily stands upright, which is an important factor for me, since I keep lots of fountain pens inside it. One thing this bag has that my other lacked is this wide, long shoulder pad. Since the strap adjusts from both sides, I finally have a bag that allows me to shorten the strap enough while keeping the shoulder pad centered. 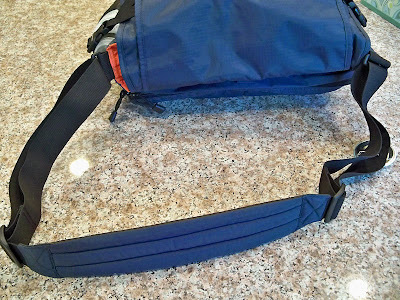 This is an excellent feature that more bags and straps should employ. On each side, there is a mesh compartment for a water bottle. This particular bottle is oversized at 20 oz, yet still fits in there. A regular 16 oz. bottle would fit better. 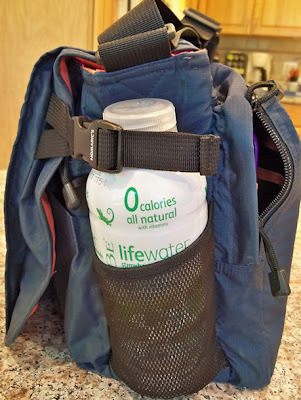 Not having to carry the water inside the bag is a great feature. It makes it much easier to take a sip while walking without having to open up the bag, or to pour extra water into a palette cup for painting. My old bag didn't have these water holders on the sides. 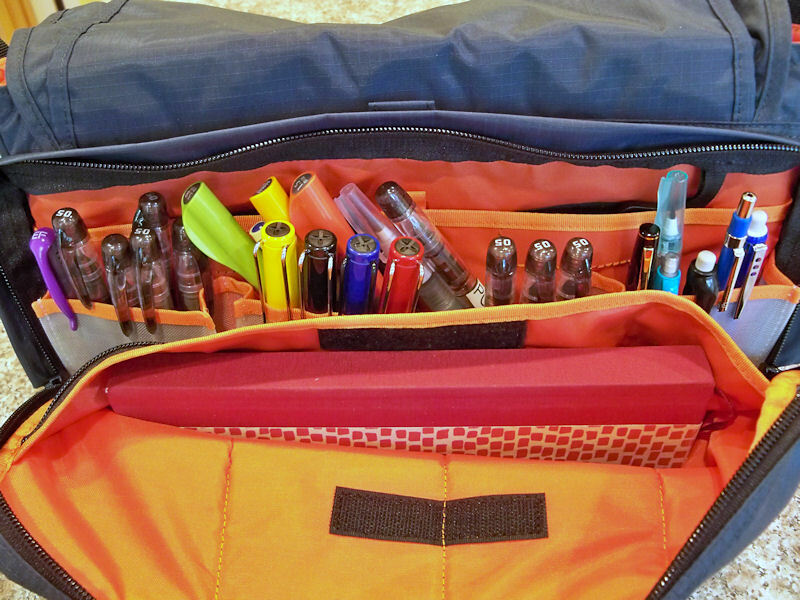 As you can see, there's room straight across the bag for loads of pens, pencils, waterbrushes and markers. A pocket in the front of that compartment can hold my sketchbook. 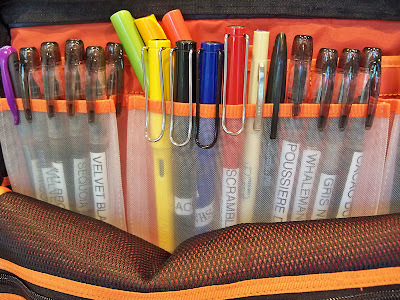 There is another large pocket behind the pens that runs the length of the bag. I keep some tissues, erasers, a ruler, viewfinder, and other sketching supplies in there. One really neat feature is these mesh pockets because they are translucent. I label all my pens so I can tell what ink is in which pen. I used to have to remove them from the pockets of my old messenger bag to read the labels and find the pen I needed, but now I can store them with the labels facing outward, and I can see what every color is! This is a huge advantage for me and a timesaver. There are also pockets in front for brushes, waterbrushes, pens, and other supplies. You wouldn't believe how much this side of the bag can hold, even though the bag is not that large. I emptied out this side to show you (below). There's actually plenty of room left for my camera, binoculars, and sun visor. I don't necessarily carry this much when I go out sketching, but it's nice to know that it will all fit when I go off on a trip; then I can leave whatever I won't be needing in the car, or wherever I'm staying if I'm traveling. There are a few more compartments in this bag that I haven't detailed in this post because I'm not even using them yet! 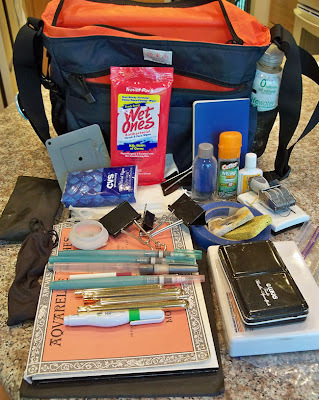 I'm sure that as I get out there and start painting and sketching with it, I'll reorganize it a bit and shift some of these items into those other pockets. If you think you'd like a Nomadic Wise-Walker too, you can find them at Jetpens in black, blue or gray. You can see lots more photos of the bag there as well. Looks like the perfect bag for you. I love seeing all your pens lined up with the labels ready to read. lol Great sketches of the waterfalls below. 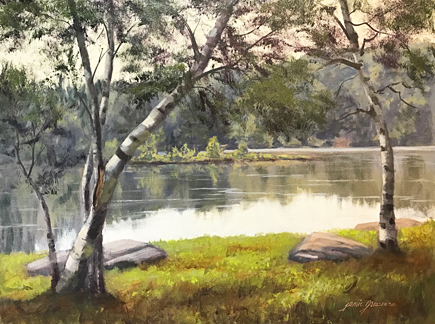 My Tuesday plein air group finally met for the first time for the season!!! Enjoy your day! Awesome review Jamie! I also love the idea of labeling your fountain pens for quick access. This is a great bag. You're tempting me, especially if it comes in black too. I always liked black better than other colors. The amount of organization inside is great, and when I use a larger bag I have a tendency to overpack and then have trouble lifting it. Hi! 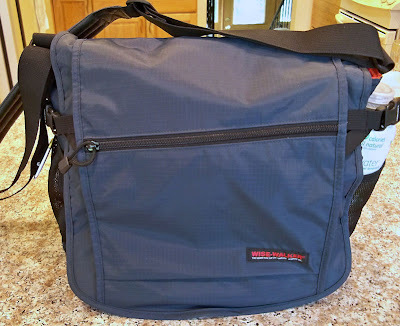 I love that you did a review on this bag, it's one of the few reviews that I've managed to find. I'm looking for a new bag to hold all the stuff I need for my college classes (including my laptop). And I was wondering if you could do an update? Maybe a video review, or something about how the bag has held up for the past few months? And do you think it would hold (without any strain) a laptop, notebooks, and other school supplies? I want to find out as much I can before buying this bag, because it is a little pricey. Many people have asked me if I'm still using this bag and how I'm liking it now. Yes, I am still using it when I travel lightly. However, I did one sketching outing with the bag fully packed, and decided that I really need to switch over to a backpack when I have that much stuff. Light and durable as this bag is, by the time I packed it to the hilt, it was killing my back to carry it around town. So, this is now my bag for "Sketching Lite", with a few coroplast boards and sheets of paper (or sketchbook), small pan set, and a few pens. I have a few backpacks that I've been using for hiking/sketching/painting, but not one that I've settled on exclusively or feel is my ultimate sketch backpack. When I find it, y'all will be the first to hear about it! 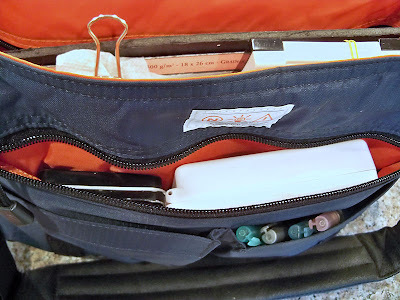 I do love this messenger bag and continue to recommend it to friends and fellow artists. Jamie, I have the same bag, and love it, but the problem that I have with it is that there aren't enough large sections to put bulkier items. The one big area is great for a sketchbook, but then you can't put any other thick items in. It is a wonderful bag and very well organized, and I do use it, but not for "take everything" trips. I use a backpack more often, and use pencil bags and the like to organize my tools. I do like how the backpack distributes the weight better, and that there's a large section for bulkier items. I tried the Nordic daypack, and LOVE it, but for some unknown bizarre reason, the front is curved at the bottom, so it falls over and won't stand upright unless you lean it against something. I may modify it somehow, because it is an awesome pack, but for now I use it as a daypack for other things. I've found well-made backpacks that aren't too huge from L.L. Bean and Land's End on sale after school starts. Still haven't found my ultimate one yet, either! Hi Leigh! I find the size to be perfect, since I cannot carry a very heavy bag over my shoulder. When I need to carry more gear, like you, I switch over to a backpack. I didn't get the Nordic daypack because I saw on a review that it won't stand upright. That's a dealbreaker for me. I use an old hiking backpack that I have and love, but I am always on the lookout for something with more compartments, so please keep me in the loop and let me know if you find something "perfect"!! Thanks for this thorough review of the Wise Walker, Jamie. It is what convinced me that it's just the bag I've been looking for, not so much as an art bag but as a flight carry-on (which, of course, is always full of art supplies!). I got a black one last Friday, and I LOVE it! 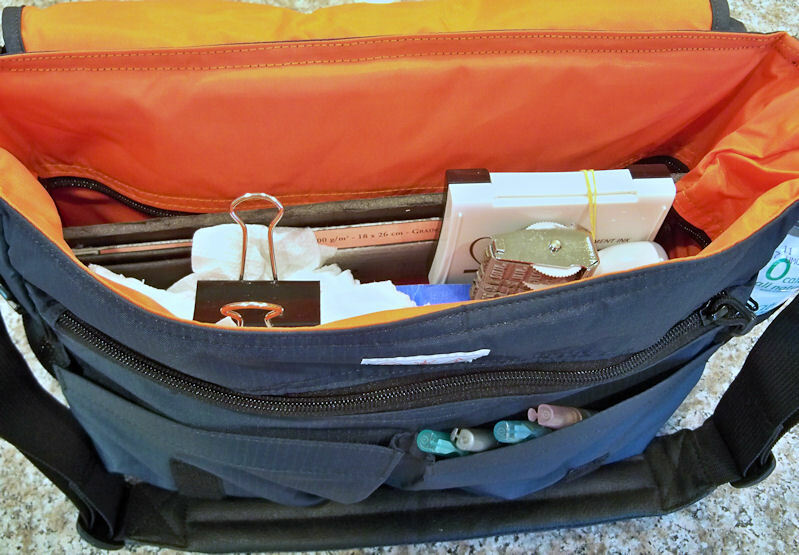 So many compartments and pockets...I'll never lose stuff in the shuffle again! Wondering how the bag is holding up more than a year later as one of the reviews at Jet Pens seem negative about the construction. On your recommendation I've been thinking of getting it. Thanks. Zoe, I'm sorry for my delayed response! I have not had any problems with the bag holding up. Although the contents now are much different than they were when I did this post, the bag itself is, IMO, without competition. I love that it is so lightweight. Like many artists, I tend to carry way too much stuff. I find the size ideal because it allows me to take what I need, but I need to be selective! That stops me from bringing along more than I can physically carry on a sketch outing. Jamie, thanks so much for sharing your update. Have a good one and Happy Sunday. I would LOVE this bag if it were about half this size...I'd just carry a lot more than I need!